Most people trace the male line in the family when they go back and look at their family tree. That’s perfectly understandable, as the surname comes down the male side, so you’re essentially tracing the ancestors who held that name. 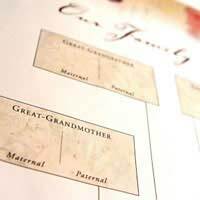 Once you’ve gone as far as you can with that, though, what can you do to keep enjoying genealogy? It can become an addictive pastime. Having gone back on the male side of your ancestors, why not look into the female side? By going back in the family on your mother’s side, you’ll find another family history. The challenges will be exactly the same as going on your father’s side. In most instances you’ll take the maiden name and trace that in the same way as your surname. There is an alternative to this, which is to go from maiden name to maiden name, going back through time. This is more complicated, and it won’t give you the same kind of family narrative as following just one name, although you will have a chance to look more closely at the distaff part of history. The techniques you learned when tracing the family history in the male surname will work for following the female line. You will still need the same records and to do as much research as you would for anything else. If you choose to follow maiden names you will still be able to go back, although once you’re back before 1837 and the advent of civil records it can become more problematic. In part that will be because you’ll be relying on parish records for baptism, marriage and death, and many of these are missing. The more important factor to remember is that there are fewer records regarding women. In most instances they had no property of their own after marrying, as anything they owned became their husband’s property, so there will be no will as there’s nothing to bequeath or leave. Going back, many marriages were common law marriages and went unrecorded. Although it’s feasible to track a man by other means, such as tax rolls, tracing women is nowhere near as easy, due to their social status, which was, essentially, nonexistent. The simple lack of records pertaining to women is going to create a set of problems that can be difficult, if not impossible, to overcome. Where the women are of higher social status this won’t be too bad, as records of all members of the family will be kept, and their unions will be fully recorded and celebrated as they were as much commercial transactions as anything. Class affects genealogy. That’s true for both genders. The lower the class, the fewer records there will be, and the more difficult your job as a genealogist. After looking at the family surname, it would make sense to progress to tracing the maiden name. Only after you have experience should you tackle jumping from maiden name to maiden name as it could be much more frustrating. Be prepared for several dead ends and to apply extrapolation and intelligent guesswork. How to Deal With Conflicting Dates in Genealogy. What's at the National Archive?